NEW DELHI: The United States may try to persuade India to consider its ballistic missile defence options in an attempt to keep it from pressing ahead with the S-400 deal with Russia. ET has learnt that the US could make ballistic missile defence an agenda point in the upcoming Indo-US 2+2 dialogue on July 6 for which external affairs minister Sushma Swaraj and defence minister Nirmala Sitharaman will be in Washington. The likely option on the table would be the Terminal High Altitude Area Defense (THAAD) system. It is a sophisticated missile defence system which is believed to be particularly effective against long-range missiles. The S-400 missile defence system is, however, said to be effective against a larger array of aerial attacks, particularly fighter aircraft such as the F-18s and F-35s. The latest version of the Russian made S-400 has a longer range but the jury is out on whether it’s more effective than the THAAD against intermediate range and intercontinental ballistic missile systems. 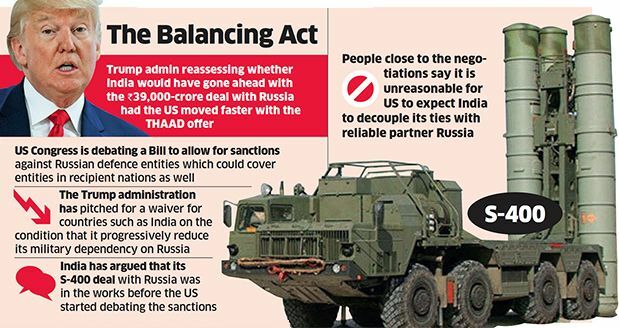 ET has gathered that India’s proposed S-400 purchase from Russia has prompted a reassessment within Trump administration on whether India would have gone ahead with the nearly Rs 39,000-crore deal with Russia had the US moved faster with the THAAD offer. Now, the S-400 deal has become a politically sensitive issue with the US. The US Congress is debating a Bill to allow for sanctions against Russian defence entities which could cover entities in recipient nations as well. Given India’s strong defence partnership with Russia, the Trump administration, through secretary of defence James Mattis, has pitched for a waiver for countries such as India on the condition that it progressively reduce its military dependency on Russia. The Congress has still not provided satisfactory relief despite hectic lobbying within Washington. The problem is compounded by the fact that the Countering America’s Adversaries through Sanctions Act (CAATSA) covers the S-400 system in the category of technologically sophisticated equipment which must be specifically targeted for this purpose. India has argued that its S-400 deal with Russia was in the works before the US started debating the subject. In any event, it will predate the CAATSA if and when it’s written into law. Besides, people close to the negotiations told ET, it is unreasonable for US to expect India to decouple its defence relationship with Russia, which has been a proven reliable partner through several conflicts. The US, senior government officials said, must appreciate that unlike many of the other countries which purchase defence equipment from Russia, India does not target Russian armament against American interests and will not do so in future. India is likely to elaborate on these lines at the inaugural 2+2 dialogue between the foreign and defence ministers of the two countries, while the US might urge India to first exhaust options the American industry can offer.